Further to Ryan Tubridy’s attack on Star Trek-watching, bedsit dwellers allegedly picking on children and celebrities online. Ah now Ryan! I’ve met you at a Star Wars convention so you obviously have time for a bit of sci-fi. Your remark probably won’t go down well with Star Trek fans. It does imply that we’re all lonesome lads on social media. Who Trek The Prime Directive Of Cable Saying The Unsinkable Staying In Tonight? 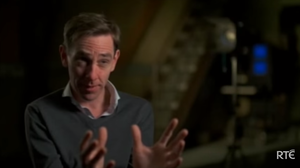 Posted in Misc and tagged Ryan Tubridy, Star Trek at 12:39 pm on March 15, 2016 by Broadsheet. I’d bet House of Tubs wouldn’t last five minutes on Klingon! Tubs’ abuse of Trekkies has been reported to the Dominion in the Gamma Quadrant ! The Jem’Hadar arrival is imminent, prepare yourself Tubs ! Wow. 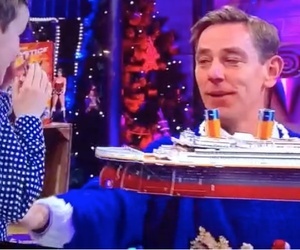 You would rather bash Tubridy over a throwaway put – down than grant for moment that he might have a point about online abuse. He’d have a point if he wasn’t painting himself as the ultimate victim of it. Comparing people critical of his awfulness as the people who destroy young peoples lives. He’s not. He doesn’t. He knows there’s a scale both of abuse and of the ability of people to cope with abuse. Why is it necessary to bend over backwards to find reasons to criticise him rather than accept that he is fundamentally right about online abuse? Because he can never be right. He is the personification of despair and all that is wrong with institutional Ireland. It is a moral imperative to chase this slimy pox out of any forum his gurning, well remunerated head pokes itself into, which unfortunately makes him a poor spokesman for not chasing people out of forums. Lorraine Higgins is another one. I sympathised with her plight before she tried to legislate freedom of speech away from her unelectable unelected perch in the Senate. Seriously? You’re choosing this guy as your avatar of the moral rot at the heart of Ireland? He’s going to be your scapegoat? Are you sure this isn’t another ha-ha-no-really effort to justify abuse because you can say what you like about a scapegoat can’t you? This is primitive atavistic stuff, believing attacking and vilifying one person will purge our sins. Stupid, but maybe that would explain it. To be fair, he can be wrong for badmouthing Star Trek fans and right about the internet being awful. big difference between Star Wars fans and Star Trek fans……big difference. Yep. The fact that the writer just glosses over this really quite extraordinary difference means everything else he says is suspect and wrong. If he has any point to make, I hereby dismiss it on this technicality. I damn him for it and everything he stands for. Also, his appeals to authority are lame. I will decide on the penalty for that at a later stage. There’s a really basic flaw in logical thinking here. That A = B does not mean that B = A. That bitter bedsit dwellers tend to like Sci fi does not mean everyone who likes Sci fI is a bitter bedsit dweller.